Has your child shown an interest in learning a sport but hasn’t had a lot of success with team sports like soccer, football, or baseball? Have they expressed a desire to learn a martial art? Fencing might be the perfect option because it is an individual sport that combines the physicality of martial arts with the strategy of a team sport. At Lilov Fencing Academy in Cedar Grove, we help young students learn how to fence in a safe, state-of-the-art facility with some of the best fencing coaches in the world. Not only is our fencing academy close to you, we also host a wide range of tournaments. Contact us today to find out how your child can start fencing and read on to learn three big reasons why fencing is a great sport for your kids. While some children seem to have an inborn sense of discipline, most kids have to work at it. One of the best ways to instill discipline and concentration is through an activity that your child is invested in. Fencing is a great way to develop these skills because it requires both mental and physical dexterity. By bringing the mind and the body together, fencing helps to solidify concepts that might take much longer to learn on their own. By making connections mentally that pay off physically, and vice versa, fencing quickly shows your children how effort can have real, positive effects. This creates a loop that keeps them practicing so they can see more improvement. Studies have shown that regular exercise can help people avoid obesity related problems and other conditions like diabetes and depression. Instilling regular exercise as an important part of your child’s life will help them to make better decisions as they get older and allow them to prioritize their physical health as a part of their overall wellness. Physical fitness not only pays off in the short term, it can also lead to a happier, healthier life. Fencing is an excellent form of aerobic exercise that will help your child build up their strength, coordination, and stamina. These skills will translate to other sports that your children participate in, whether it is football, soccer, gymnastics, or track and field. Nothing will make your child feel more accomplished than learning and competing in a new sport. We have found again and again that children who take fencing lessons and begin to participate in tournaments feel better about themselves. Even if they don’t win, our fencers keep working to improve so that they can compete again. You’ll probably notice a boost in your child’s confidence levels in all parts of their life, and you shouldn’t be surprised to see them take on other challenges that they might have been too meek to attempt before. 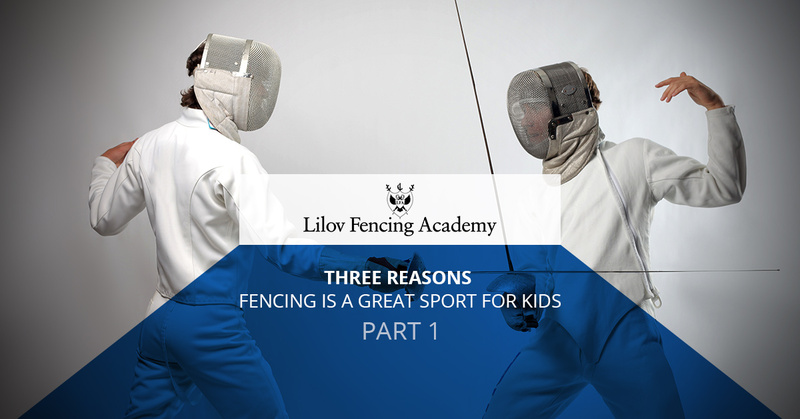 Come back next time for three more reasons why your kids should take fencing classes at the Lilov Fencing Academy. Contact us now to find out when your child can start learning this exciting sport!